Plastic bags do not biodegrade. Light breaks them down into smaller and smaller particles that contaminate the soil and water and are expensive and difficult to remove. Less than 1 percent of plastic bags are recycled each year. 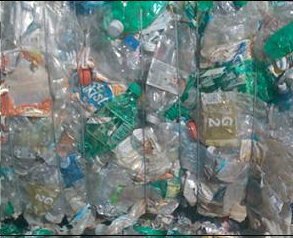 Recycling one ton of plastic bags costs $4,000. The recycled product can be sold for $32. When the small particles from photodegraded plastic bags get into the water, they are ingested by filter feeding marine animals. Biotoxins like PCBs that are in the particles are then passed up the food chain, including up to humans. Before you grab another resealable bag when packing your child's lunch, consider how easy it is to make a difference nearly every day! Kids Konserve can help! They are all about the common goal we all have...to help the environment by helping you with eco-friendly every day options at affordable prices. The Kids Konserve waste-free lunch kit and other reusable products were the natural outgrowth of what two women saw as a big need that required immediate attention. With the premise that any business they undertook had to help the environment in some way, it didn’t take much imagination to see how they, as parents of young children, were contributing to garbage landfills, pollutants and sending the wrong message to their own children. How could they set an example of conservation for their children and empower them to be the examples of change for the future? Kids Konserve offers a full line of eco-friendly products, specializing in lunch kits that are bright, fashionable and user friendly! you can green up how your child's lunch impacts the environment, creating an eco-example and opening the door to conversation and education about conservation with your child. High quality products that are also earth-friendly? Sturdy construction with cool and bright design? 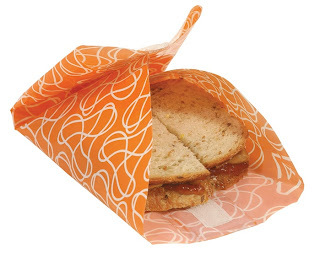 Rethink your lunch and snack on the go resources and find greener alternatives from Kids Konserve! My family was given an opportunity to test the Kids Konserve Snak Pak, and we love it! Even my son thought the green design was cool and funky! The Snak Pak is made of a cotton draw string bag which is machine washable and can be line or light machine dried. The bag is approximately 9" x 13" so it fits perfectly in a backpack! 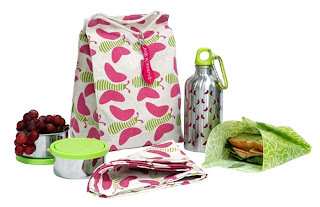 Within the kit, you'll find also a cotton napkin, a stainless steel leak proof food container and a Food Cozy - the answer to the disposable plastic bag dilemma! 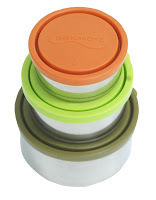 The Food Kozy is a 13.5" plastic round with velcro closure which can be used in place of disposable plastic bags in both your packed lunches and snacks, as well as for food storage at home! Washable with warm water, the Food Kozy is made from #4 plastic and is recyclable! 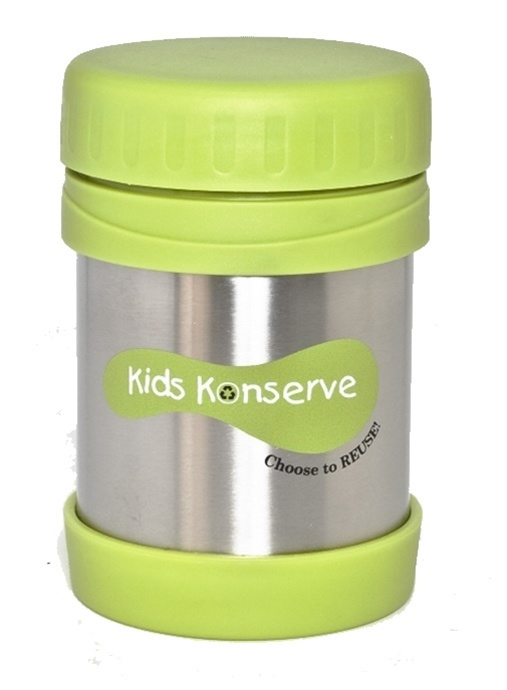 The Kids Konserve Snak Pak retails for $22.00 and you may elect to add a 20oz Kids Konserve Stainless Steel Water Bottle for only $8.00 more! Extra Food Kozys can be added to your order as well! Choose from Orange, Green, Magenta and Mud designs. 5 packs available for $23.00 or 2 packs for $9.00. As a lunch packer, I found the Snak Pak to be completely functional, very chic, but I do recommend selecting some additional containers, such as the Stainless Steel Nesting Trio and the Insulated Food Jar for additional packing options! Beyond providing eco-friendly options for consumers, Kids Konserve strives to educate and inspire. Kids Konserve offers a product, MOST importantly Kids Konserve is a message. Kids Konserve spreads the word about the importance of REUSE. The company recently celebrated their 2nd Anniversary and they are driven by the amazing response they have received and warmhearted by the impact that they are making. 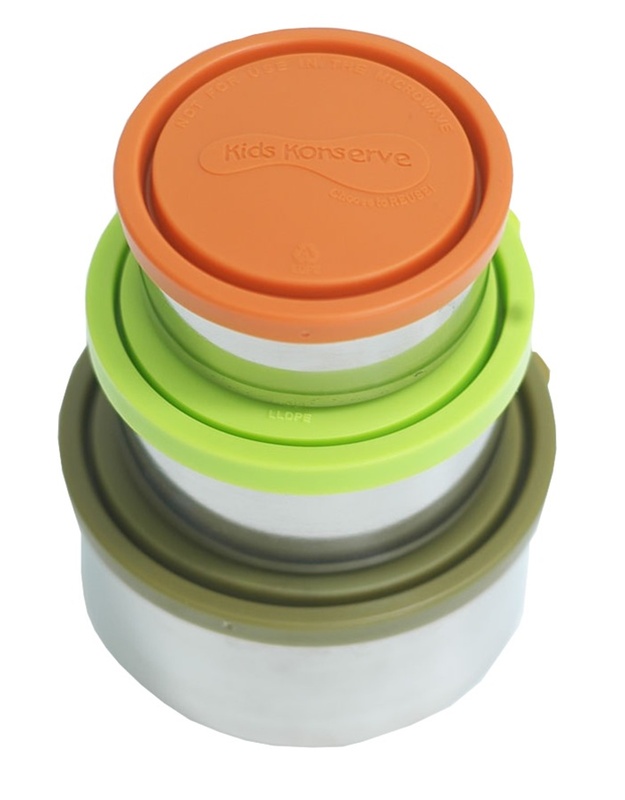 Kids Konserve products are Non-Toxic, Non-Leaching, BPA, PVC, Phthalate, and Lead - Free! Purchase your Kid Konserve lunch kits and supplies and be certain to check out the custom bottle options for your school or group. Take advantage of the Kids Konserve Earth Month April Specials! Special discount for That's What She Said readers good until 4-30-11, get 20% off your purchases with code forearth! There's still time to get involved in the Kids Konserve Waste Free Challenge for Schools! Kids Konserve is generously offering my readers a chance to win a Snak Pak of their own! To be eligible to enter, you must follow That's What She Said via Google Friend Connect (mid right sidebar). This giveaway is open to residents of US & Canada, ages 18+ and will end on Saturday, May 21, 2011 at midnight, EST. The winner will be randomly selected from all eligible entries and notified by email. Winner will have 48 hours to respond before I must move on to a runner up. Please leave your email address in your entry comments, in anti-spam format, if it is not available via your comment name, so I may contact you if you are the winner. To be eligible to enter this giveaway, you must follow That's What She Said via Google Friend Connect (mid right sidebar). For Mandatory Entry, please visit Kids Konserve and then come back and tell me in a comment what your favorite product is. IF YOU ALREADY FOLLOW/LIKE, ETC - TAKE THE ENTRIES! * Tell me in a comment something you learned at the Kids Konserve website, 2 entries. * "Like" Kids Konserve on Facebook, leave a comment here with your FB name, 3 entries. * "Like" That's What She Said on Facebook, leave a comment here with your FB name, 3 entries. * Follow Kids Konserve on Twitter, leave a comment here with your twitter name, 3 entries. * Follow That's What She Said (tsue1136) on Twitter, leave a comment here with your twitter name, 3 entries. Make a #green lunch w/ @kidskonserve! Chance to #win $22 Snak Pak kit from @tsue1136 at That's What She Said http://bit.ly/h7CUXI Limit 3 tweets per day, 1 entry per tweet. * Follow That's What She Said via email or RSS subscription (mid right sidebar), leave comment here with applicable name, 3 entries for each. * Enter any of my other active giveaways or comment on a non giveaway post, leave a comment letting me know which, 3 entries per additional giveaway/post. * Share this giveaway in some method other than tweeting ~ anything goes. Blog, post on FB, Digg, Stumble, Technorati, add to a giveaway linky, email to friends. Leave a comment with a link to your sharing. 3 entries per sharing. * Explore the Kids Konserve Ways To Contribute Page and tell me in a comment your favorite tip or what inspired you to go greener, 2 entries. * Tell me how you are going greener this year or what someone else has done to inspire you in your green efforts, 2 entries. This giveaway is closed. On behalf of Kids Konserve and That's What She Said, thank you for following and participating. Congratulations to kolpin, comment #132, courtesy of Random.org! Images and information taken from various Kids Konserve websites or provided by Kids Konserve. Some statistics sourced from other sites, cited above. I received a Kids Konserve Snak Pak to explore for the purposes of creating this feature. The opinions above are both honest and my own. Kids Konserve is sponsoring the giveaway and is responsible for shipping. I like the caterpillar waste free lunch kit. Their orange shopping bag is also pretty great. Fact: kids produce 67 pounds of lunchtime trash each year. We use cloth instead of paper whenever we can: bags, towels, napkins, diapers, wipes, etc. I found their guide to different types of plastics helpful. We try to avoid plastics as a rule, but it's nice to know which can recycle and which can't. GFC Follower and I like the BEACH INSULATED LUNCH SACK, too. I learned at the Kids Konserve website that we buy more than 1/2 billion bottles of water each week which is enough to circle the globe twice. Went to the website and learned that their EarthLust water bottles are made from naturally safe unlined high-quality stainless steel! I like kids konserve on fb as maurine a.
I am following and I would choose the whimsy snack pack in mud. my fave tip is Know Your Plastics: Many plastics are not recyclable. #1 I LIke That's What She Said on Facebook (Emm Enger). #2 I LIke That's What She Said on Facebook (Emm Enger). #3 I LIke That's What She Said on Facebook (Emm Enger). 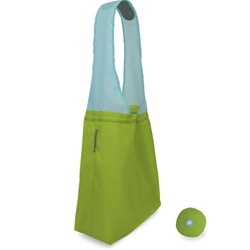 I love the Pea Green 24-7 Compact & Reusable Shopping Bag! I follow as moreno.cassie! I like the NESTING TRIO.